Bibliographic Information: Kerim, Silvia. Povestiri despre prietenii mei [Missy and my Other Friends]. Ills. Victoria Argint. Bucurest: Aramis Print, 2009. 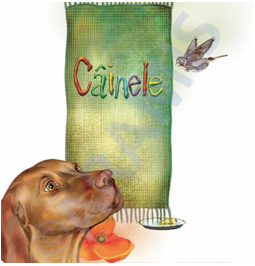 Story 1: Câinele [The Dog] In the summer, the author meets a dog, which draws her attention. Impressed by its behaviour, she writes a story, which is a dialogue between a sparrow and a dog. The talkative sparrow manages to understand why the dog is faithful to man. Story 2: Calul albastru [The Blue Horse] Rudi, the main character of the story, is a tall and strong horse, which works hard in the field or enjoys happy Sundays along with its masters. The peaceful life of the horse is interrupted by war. Rudi, the mare Ilse, and their master Shamu go to the front line. When the war is over, Shamu comes back home without the horses: Ilse was deadly wounded by a shell and Rudi disappeared. After a while, Rudi comes back home and it is warmly welcomed by its master. Although it is very well looked after, the sufferings caused by the war shorten its life. It dies having its head turned to the place where Ilse used to stay. The first story is inspired by reality, which arouses not only the children’s curiosity but also the grandparents’ memories. The second story presents the real world of a Romanian village. These are interesting and sensitive visual stories, which include elements of the culture that has produced them.